Recreational and professional activities bring people in contact with water everyday. Safety on and near the water is an issue for the weekend sail boater as well as for military and rescue personnel. Flotation devices are an important part of water safety. Full-body, industrial survival suits and simple water ski belts are two extremes in the family of personal flotation devices available. Although they differ tremendously in the amount of protection, the goal of all safety apparel is survival. Life vests and life jackets are technically known as PFDs, short for personal flotation devices. They are designed to keep an individual afloat in the water in the event of an emergency and are considered life-saving equipment. The main function of a PFD is to keep a person on the water's surface in a relatively upright position to allow the person to breathe and not have to tread water to stay afloat. U.S. Coast Guard regulations require a boat to carry at least one Coast Guard approved PFD per person, including one for each person water skiing. There are five categories of Coast Guard-approved personal flotation devices. Each of the five categories provide different flotation and body positioning specifications. Types I and II PFDs are full- and half-length vests designed to turn an unconscious person from a face-down position to a vertical or slightly head-back position floating in the water. These vests are usually big and bulky. A type IH PFD, most commonly used in recreational activities, is also a buoyant vest or jacket. This type is designed to keep a conscious person afloat in a vertical or slightly head-back position. This type comes in many styles and is the most comfortable. A further difference in the I, II, and III types is that the specific degree of buoyancy required increases from type III to type I. Throwable devices such as a ring buoy or the buoyant cushion typically used by boaters as a cushion for sitting are considered Type IV. Type V PFDs are special-purpose devices for aircraft pilots who fly over water, rafters, and ferryboat pilots. Natural materials were first used to create floatation devices. Before 1900, life jackets were made from cork and balsa wood. A material called kapok was later used as the fill material in life vests. Kapok is a vegetable fiber found in tropical tree pods, resembling milkweed. The waxy coating which covers the kapok fiber provided the necessary buoyancy. The kapok fiber was sealed in vinyl plastic packets to prevent exposure to the water. One problem with the vinyl-sealed kapok fiber life jacket was that the packets could be punctured, causing the jacket to lose its buoyancy. Kapok is now prohibited for use in life preservers in most of Europe and in Canada. The Coast Guard made a significant change in life vest requirements after the 1953 sinking of the ore carrier Carl D. Bradley, in which 33 persons died. Many crewmen were found floating among their life vests, having slipped out of them after the ship had sunk. Thereafter, the Coast Guard required that life jackets be designed so that unconscious persons could not accidentally slip out of them if immersed in water. In the 1960s, France introduced a life jacket called the flotherchoc. The flotherchoc was a light and flexible body-fitting vest. This design replaced the then popular but awkward horse-collar design. The advantage of this vest was that it was less confining and, therefore, more likely to actually be worn. The flotherchoc was made up of small, air-filled vinyl packets which were placed inside nylon chambers. However the flotherchoc had the same problem as the PFDs which used kapok: over time, the flotherchoc's vinyl packets could lose their buoyancy if punctured. Plastics are now being used in the manufacture of life vests. Some vests are made from closed-cell foam or foamed plastics which are encased in nylon. Closed-cell foam has been around since the 1940s, but it was not until the 1970s that its use in survival wear was introduced. A closed-cell foam insert is made of tiny, individual air-filled pockets within the foam itself. The air-filled pockets are called cells. This foam structure is similar to a sponge, except that in a sponge the individual cells are connected by tunnels which run throughout the material. Closed-cell foam cells are not connected at all. It is the isolated air-filled pockets which provide the flotation. Closed-cell foam can be punctured over and over again with only minimal effect on its buoyancy. Some of the better closed-cell foam structures will not deteriorate even under tremendous compression. The air-filled pockets also provide some thermal insulation protection against hypothermia. 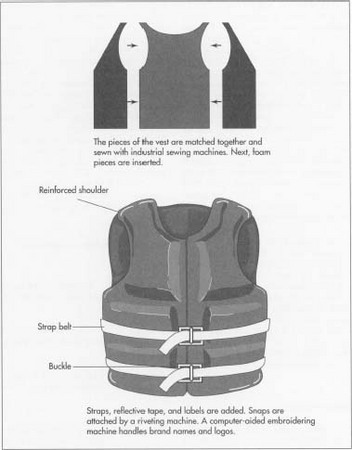 Described below is the process for the manufacture of a standard Type III personal flotation vest containing closed-cell foam encased in nylon with various finishes, including reflective tape, zippers, snaps, and labels. Most of the materials required to manufacture life vests are purchased in bulk from sources outside the manufacturer. Some materials come from custom fabricators and are specifically made to meet certain standards. Threads for stitching seams and for embroidery of logos are purchased from one source. Nylon fabric is purchased in bulk which is typically 60 inches (152 cm) wide by 20 or 30 feet (6 or 9 m) long. The width of the fabric generally corresponds to the standard width of cutting machines. The same width specifications apply to the closed-cell foam which is purchased in thick pieces. Non-corrosive plastic zippers and snaps are purchased from still another outside source as are materials like strapping and reflective tape. Finally, labels specifying Coast Guard Approval and other information regarding the classification of the individual product are obtained from testing organizations such as United Laboratories. The steps in the manufacture of life vests are similar to those for any automated garment manufacturing process, differing in specific features such as raw materials and, more importantly, safety specifications. The operations necessary to complete a garment from scratch are known in the industry as "cut-fit-trim." As many as 100 life vests may be manufactured simultaneously in an automated manufacturing process such as the one described here. 1 Pattern designs are digitally fed from a computer into a machine called a plotter, which draws a stencil of the pattern design on long sheets of white paper. The drawn sheets are called markers. 2 A machine called a spreader unrolls a bolt of nylon fabric along a table, usually 66-72 inches (168-183 cm) wide and up to 100 feet (31 m) long. Thin fabrics such as nylon may be layered 25 deep for cutting. Wrinkles are smoothed by the spreader or by hand, and the marker is laid on top of the nylon. portable, motor-driven straight knife which resembles a jig saw. In automated cutting, the digital pattern is fed into the cutting machine. A sheet of cellophane, wider than the fabric, is drawn over the top of the marker and fabric layers. A vacuum pulls the cellophane down tight against the table, holding the marker and nylon layers in place. A knife cuts the pattern out of cellophane, marker, and fabric layers at the same time. The cut pattern pieces are then bundled for transfer to assembly areas. The marker, which can be read through the cellophane, identifies the pattern pieces. 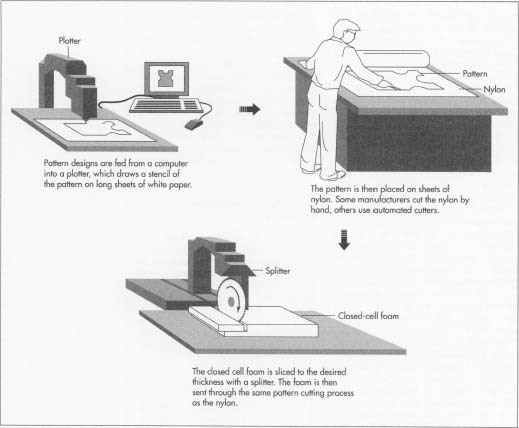 4 The closed-cell foam is sliced to the desired thickness with a type of band saw called a splitter. A band saw has a long thin blade welded in a continuous loop that travels over a driven wheel up and over one or more idler wheels, and then down through the material being cut. The foam then goes through the pattern cutting process in the same way as the nylon. 5 Reflective tape and small, attachable pieces such as straps are cut from rolls with a smaller cutting machine called a die cutter. cut foam pieces are inserted through an open seam which is then sewn shut. 7 Straps, reflective tape, and labels are sewn on last. Snaps are attached by an eyelet or riveting machine much like that used by a shoemaker for shoelace holes. A computer-aided embroidery machine—much like those used by department stores to personalize towels—is used to embroider brand names and logos. 8 Individual finished vests are placed in plastic bags for protection. The bags are packed into corrugated boxes and sent to distribution centers. Quality assurance in any safety product is very important because a person's life may depend upon the manufacturing quality. The United States Coast Guard and Under-writers Laboratories have been monitoring the development and manufacturing of life jackets for many years. Federal law sets very high manufacturing and performance standards that must be met before the Coast Guard will approve a PFD. The PFDs which are approved are recognized by a stamp on the PFD itself or on an attached tag. Some manufacturers insure that all materials that go into the manufacture of PFDs are checked and meet, or exceed, Coast Guard Standards before any cutting or assembling is done. Defects are also monitored by manufacturer station supervisors. Public response to product performance may also be solicited. Typically, samples from batches are lifted and sent to international standard keepers such as the International Standards Organization (ISO) for comparison with ISO 9001, the highest level of international recognition of quality of design and manufacturing. Some manufacturers have even the most incidental materials designed and made to exacting specifications for their particular product. For instance, threads for stitching seams and embroidery may be tested for disintegration tolerances. Nylon fabric made from high-tenacity yarns is specifically tested under ultraviolet light for up to 600 hours to check for premature aging due to exposure to the sun. Closed-cell foam may be scientifically developed especially for a single manufacturer with specific floatation needs. New developments in life vests and other personal flotation devices will continue to address the comfort of life-saving apparel while not being used for flotation. Flotation devices which inflate only when needed are the newest products to address this issue. Inflatables lie flat on the body and pose no bulky restrictions until inflation occurs. Inflation may be spontaneous, as in the event of water immersion, or manual. Automatic inflation works by the controlled release of carbon dioxide. Some of the newest devices available are inflatable vests, collars, and pillows built into full-body, insulated survival suits. Although currently not Coast Guard approved, some inflatables exceed Type I specifications. The BOAT/US Foundation reports that participants preferred the wearability of the inflatable devices because of their non-restrictive features. Life vests will continue to evolve as designers, manufacturers, and testers overcome challenges such as comfort, controlled inflation, and loss of buoyancy. Baldwin, Mark. "The Survival Suit Saga." Oceans, September-October 1986, pp. 40-45. Sutphen, Hal. "Will It Work When I Need It?" Cruising World, March 1994, pp. 19-22. Sutphen, Hal. "How to Equip for Safety." Cruising World, December 1993, pp. 75-80. Department of Transportation. The Skippers Course. United States Coast Guard Office of Boating Safety, Washington DC, 1973. I would like to writte the procedure for life jackets and vests scrap so please send me one of the procedure if its possible. Can I cut a life vest off at the bottom and sew it up? I can't find one short enough for me while kayaking. The one I have shoves up to my head.